“I tried this book out on some children in the 4-to-8 range for which it is intended and they loved it. The book even inspired us to, move to the kitchen. 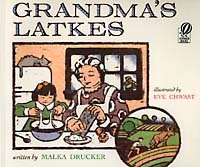 “Grandma’s Latkes is a faithful rendering of the ancient story of the Jewish rebellion against armies of the Syrian king Antiochus….What makes Ms. Drucker’s account so charming is how the story gets told. -Ari L. Goldman, New York Times religion reporter.